WATCH: Amy Goodman on PBS’s Tavis Smiley on Dakota Access Pipeline & Land Defenders at Standing Rock | Democracy Now! Amy Goodman appeared on PBS’s Tavis Smiley on Tuesday evening, September 20 (rebroadcast Wednesday, September 21), to discuss the Dakota Access pipeline and the land defenders at Standing Rock and across the country. 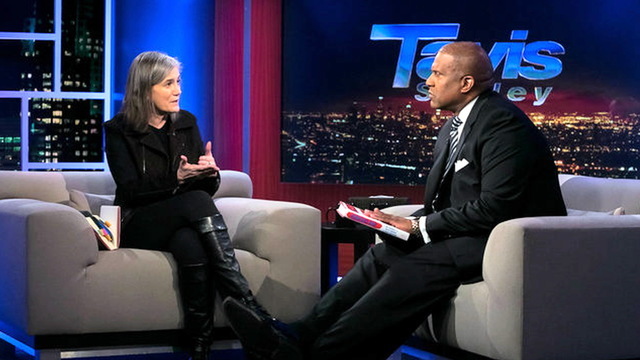 TAVIS SMILEY: Amy Goodman joins us tonight from the studios of Democracy Now! in New York City. Amy, good to have you back on the program. AMY GOODMAN: Oh, it’s great to be with you, Tavis. TAVIS SMILEY: I want to make the most of our time tonight, so let me jump right in and ask you to explain to those who have not heard about this or have been hearing of late this story gaining some traction. Tell me about the Dakota Access pipeline, this construction project, and what the controversy is surrounding this property. AMY GOODMAN: So we’re talking about North Dakota right now and the Standing Rock Sioux Tribe. The resistance to this pipeline began on April 1st. This is a $3.8 billion pipeline that would make its way from the Bakken fields—its fracked oil—from North Dakota through South Dakota, over through Iowa and then on to Illinois, and then link up with a pipeline down to the Gulf. This is going through Native American sacred ground, tribal burial grounds, and the Standing Rock Sioux Tribe are deeply upset and are resisting. And that resistance has grown. Not just one tribe, but at this point hundreds of tribes are represented. Thousands of people have set up resistance camps, among them, for example, the Sacred Stone Camp. That was the first on April 1st, and the Red Warrior Camp. Native Americans are coming from the Pine Ridge Reservation in South Dakota. Indigenous people are coming from Ecuador, from Canada, from Cheyenne River, from northern Minnesota. And they see this as a threat overall to their land, and not only Native land—this is a struggle that many people have joined in alliance with the Native Americans, seeing it as a struggle against dependence on fossil fuel. The Native Americans see themselves not as protesters, but as protectors, and they’re deeply concerned that the Missouri River, under which this pipeline would go if it was granted a permit, which it has not yet been granted—this is one of the longest rivers in North America, feeding, what, 10 million people. And they say they are water protectors, that water is life. And the resistance has only grown. TAVIS SMILEY: Who is behind the construction, and who signed off on the permit for them to begin the process? AMY GOODMAN: Well, that would be the Army Corps of Engineers. 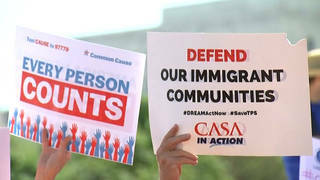 And it’s very important you raise this issue, because there’s been a series of court decisions that have come down, mostly recently in the last few days. 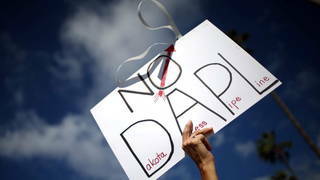 The Sioux Tribe, the Standing Rock Sioux Tribe of North Dakota, has tried to get an injunction against the permitting of this pipeline. They went to federal court in Washington, D.C. This happened right before Labor Day. 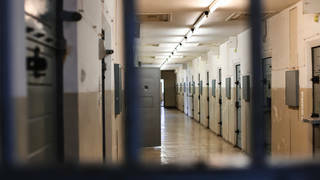 And the judge there said he wanted a map of the tribal grounds, of the burial grounds, that they felt were going to be excavated, going to be destroyed. They handed over that map, and many feel it’s that map they handed over right before Labor Day that the Dakota Access pipeline company got and actually targeted the sites that they pinpointed as their sacred burial grounds. And this is what led to a major protest on that Saturday of Labor Day. Wasn’t intended actually, originally, to be a protest. The Native Americans who were at the big encampment did not realize that the Dakota Access pipeline was going to be building that Labor Day weekend. They went to plant their tribal flags. There are a lot of ceremonies that are held as thousands of people are coming throughout the Americas. But then they saw the bulldozers, and Democracy Now! was following them. And we saw one bulldozer, two bulldozers, three bulldozers. Another comes over the horizon and another. And the people were shocked. And this was the land that they wanted protected. And they moved in, told the bulldozers to back off, to stop destroying these sacred grounds. It wasn’t minutes before the pipeline security—not police, this is just the pipeline security—one of the security officers tackled one of the Native Americans. And it moved on from there. Then guards were bringing in dogs, and the dogs were biting the protesters. It was really a terrifying scene. But the Native Americans kept walking, and the bulldozers were moving back. I mean, you had dogs biting protesters. As we focused our camera on one of what looked like a German Shepherd, his mouth and his nose was covered, was dripping, with blood. And that same dog and its guard moved on. The guard just pushed the dog down the line of Native Americans, pushing the dog into the crowd. The guards were using these dogs as deadly weapons. TAVIS SMILEY: How, Amy—I’m not naïve in asking this question, because I hear your point very powerfully, and I thought of Birmingham '63, as well, when I saw these photos. It's so reminiscent of that era. So, again, I’m not naïve in asking this, but how can the governor and the state government, how can the Army Corps of Engineers—make that the federal government—how can the government be so tone-deaf? Because were this Forest Lawn Cemetery here in Southern California, just miles from our studio, or certainly were this Arlington National Cemetery, another sacred burial ground, or anyplace else I’d like to think in the country other than on a reservation, somebody would have the good sense to say, “We cannot just plow through a sacred burial ground.” How was the government so tone-deaf on this? AMY GOODMAN: Well, this is absolutely critical. It’s the pipeline company that was doing this, but the Native American tribe immediately went to the federal court to ask for a temporary restraining order. They got it in some areas, but not in this area. And then, at the end of that week—this was, what, September 9th, Friday, September 9th—the federal judge, Judge Boasberg in Washington, D.C., ruled against the tribe. But it looked like it was going in that direction. So, on Thursday, the day before this ruling, the governor of North Dakota called out the National Guard in preparation for the ruling and, on the same day, issued an arrest warrant for me. Now, what happened with this video that we had, as the only major national journalists on the scene with video cameras, is we published it on Sunday—that was Labor Day weekend—and it went viral, more than 13 million hits, and every network, as well as NPR, CNN, CBS, NBC, all over the world, Native sites all over, started running the bloody dogs and showing the dogs biting the protesters. And this was all building. In fact, you may remember that week, President Obama was in Laos, and he had a town hall with students. And the last question was asked by a young Malaysian woman, and she asked him about the Dakota Access pipeline and whether the U.S. government would respect treaty rights and respect indigenous people. Then President Obama came back to the United States, and, interestingly, although the court ruled against the tribe that Friday, that Friday, September 9th, 15 minutes later, an unprecedented letter was issued by the Interior Department, the Justice Department and the Army Corps of Engineers, saying they would not grant at this point a permit under the Missouri River—under the Missouri River. This was shocking to the tribe, after being routed in this decision, you know, soundly defeated. In fact, it was Justice Department lawyers who had argued against the tribe, and it was the Justice Department that basically overruled their own lawyers. And they said there had to be a pause and an evaluation done, government-to-government meetings—talking about the U.S. government and the tribal government. Extremely significant. But still, the tribe appealed the judge’s decision. That was the executive making that decision, but the judge’s decision. And just in the last few days, the appeals court ruled—well, sided with the tribe and said that it’s not only that the pipeline has to voluntarily stop until full environmental assessments are done, but they said they were mandating them to stop, the court. TAVIS SMILEY: There are a couple of questions I want to ask now. One is, back to the comment you made a moment ago, and I know—I’ve had this experience to some degree myself. No journalist wants to become the story. You were in North Dakota to cover this story, and yet you become a part of the story when there’s an arrest warrant issued for you. I opened this program tonight by asking the audience what it says about free speech in this country when a journalist of your stature—any journalist, but certainly one of your stature—who acknowledges and announces that she’s on location as a reporter—we can hear you on tape telling these persons you’re there as a reporter to cover this story. What does it say then when a journalist of your stature is then issued an arrest warrant? AMY GOODMAN: —precisely doing my constitutionally protected job. And that’s what the criminal complaint said. I think the problem is, is that it sends a message to all journalists—and I’m especially concerned about young independent journalists—that the price is too high to go and cover this issue. But that’s our job as journalists, is to go to where the silence is. You know, Tavis, it is not silent in North Dakota. The indigenous people are speaking out strongly and firmly, not only for their own tribe, but for the fate of the planet, climate change. It’s just that it’s not hitting the corporate media radar, which is why they are using our footage. I mean, to see the dogs, the people screaming, seeing the wounds of the dogs, is absolutely terrifying. And that is our job, to be there. You know, there’s a reason that freedom of the press is so important, because it serves the public’s right to know. How do people make decisions if they are not informed? An independent media is essential to the functioning of a democratic society. TAVIS SMILEY: We are in the midst of a season where we have been discussing, and, for some, debating, some not accepting the notion that black lives matter. And, of course, that turns into this notion that blue lives matter. The question I’m asking here, I guess, is whether or not these lives matter. Do the lives of these Native Americans matter? Were these persons not Native Americans, might they be treated differently? AMY GOODMAN: Oh, I mean, I think there is no question. 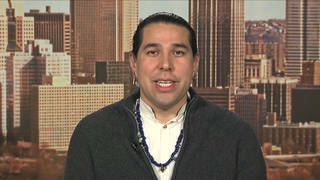 And interesting that you should raise Black Lives Matter, because Black Lives Matter activists have gone in solidarity with the Standing Rock Sioux Tribe and with many of the other nations who have come, indigenous nations, American Indians, from Canada, from Latin America and from throughout the United States. It is a real map of the proud tradition and legacy of people standing up as protectors of the land. But these are movements that need to be heard, and all of the corporate media has a responsibility, as well. You know, it’s our job to cover movements, because movements make history. TAVIS SMILEY: Tell me how—how and why—it’s probably a better way to put it—how and why, Amy, the issue of water has been pushed so high up on the political agenda in this season? AMY GOODMAN: Well, you know, this is an issue all over the world and in the United States. The people of California, where you are, Tavis, is so important because you have a drought. And, you know, the Native people of North Dakota, their—the land, the Cannonball River, the Missouri River, they worship clean water. You know, one young man from the Pine Ridge Reservation who was bitten by a dog, who was pepper-sprayed, I talked to him after and asked him if this was worth the price. He said, “You know, even these guards, they need water. We’re doing this for them, as well, because we all need water.” They’re fighting for clean water. TAVIS SMILEY: Yeah. Since you mentioned these pipelines, let me ask what the parallels are, as you see them, Amy, between the fight against the Keystone pipeline—again, for those who might not have heard as yet of this fight over the Dakota Access pipeline—thanks to Barack Obama and his intransigence for a certain time, and thanks to Hillary Clinton and her flip-flopping on the Keystone issue, at least most Americans, I think, have at least heard of the Keystone pipeline now. What are the parallels between the fight against this Dakota Access pipeline, politically, and the Keystone pipeline? AMY GOODMAN: Oh, I mean, this is very important, and there are a lot of parallels. I think a big difference why the Keystone, at least for a period of time, got a lot of attention, I think the Keystone XL got much more attention because it was not only Native Americans who were fighting against it, but I have to say it is Native Americans standing tall, standing proud, with allies from all over. The Dakota Access pipeline is almost as long as the Keystone XL, and it has enormous significance. Keystone was coming from the dirtiest tar sands in Alberta, Canada. And what oil the Dakota Access pipeline is getting is from the Bakken oilfields. It’s fracked oil. You raised Hillary Clinton, and it’s a very important issue. On what side does she stand here? Bernie Sanders had a major rally in Washington, D.C., recently, coming out against the Dakota Access pipeline. Hillary Clinton has not made her position clear yet. 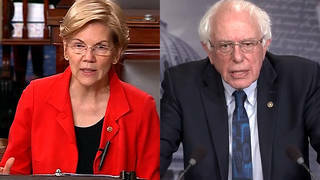 On Keystone XL, she was for it, before she was against it, and she became against it because of movements, movements demanding that if she was going to be the Democratic Party candidate, she had to bend to the will of the people, respond to people. That’s what democracy is. 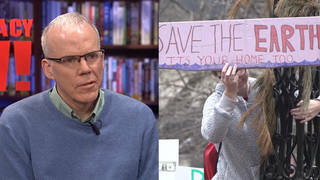 And Bill McKibben just wrote an open letter—the founder of 350.org—asking Hillary Clinton why hasn’t she spoken out on this issue. And it’s a critical point. We’re talking about fracked oil. We’re talking about an area of North Dakota, the Bakken oilfields, also extremely dirty oil. And I was speaking to an oil truck driver who’s been driving there in the Bakken oil fields for like four years. He said, “You know, that the bottom has dropped out of the oil market. I mean, in the last year, there is so much less demand for this oil.” You could just see it, the destruction of the Native lands, the pipeline built, and then it’s just set aside. They don’t need it anymore. But the Native American people are saying they’re not going to accept this. And they’re pushing hard to ensure that, like the Sandpiper pipeline, this $3.8 billion pipeline does not get built, and the resources and the federal government, you know, working with this pipeline company, instead pours the money into renewables. TAVIS SMILEY: Yeah. Let me ask what you think it’s going to take to get Secretary Clinton on the record on this issue. And I ask that, again, because we saw the flip she did on the Keystone pipeline. You make the point very clearly, that she finally came to the right decision because she was pressured. And so, that, again, is how democracy works. But it just seems to me that you have to learn some lessons at some point. 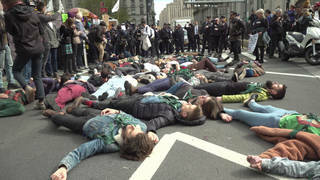 So if you got pushed on the Keystone pipeline to eventually get to the right place, why do we have to go through the same process again to push and push and push, and protest and protest and protest, and finally somebody wakes up and they get that they should have come out against this a long time ago? What’s it going to take to get her on the record? And I’m not beating up on her. I suspect that Mr. Trump doesn’t know about it, doesn’t care about it, and will never be, you know, with the people anyway. But at least Hillary Clinton, you feel you have someone to appeal to. How do you read that? AMY GOODMAN: Well, it’s just about movements. It’s really not about her, and it’s really not about him. These politicians need votes in this critical election year, and it’s a matter of how loud those voices are and people banding together making their demands. It’s not about the individual. You saw that Hillary Clinton changed her view on the Iraq War, well, because Barack Obama, the senator who was running for president, he was opposed to the Iraq War. She was for it. She voted for it as a senator. And it was only when she lost that she accepted that she had made a wrong decision and now says that decision was wrong. And why did he win on this issue? Because movements, people deeply concerned about peace, deeply concerned about energy independence. And for many people, that doesn’t mean fracked oil in the United States. Again, it means wind. It means solar. It means preserving this planet and taking climate change seriously. It’s all about the movements. You know, a candidate that becomes president, whoever that is, is a door. The door opens a crack. The question of whether it’ll be kicked open or slammed shut is not up to that one person in the Oval Office. It’s up to all the people who have pushed through history to make a difference. TAVIS SMILEY: There was an issue of New York magazine you might have seen just, I guess, a couple of months ago, if that long ago, a huge cover story. You can go online and read it. And I only raise it—I should say, full disclosure, I was a part of the story as one of the many members of the media that New York magazine interviewed for a cover story. The entire magazine, I think, was dedicated to this notion of what’s wrong with the mainstream media. And it was interesting to hear the voices of persons in the mainstream media critique what’s wrong with the mainstream media. But I raise that, Amy, because one of the points I made in my section of the story was that the mainstream media so often these days is just late to the story. They have all the resources. They have all the staff. They have all the money. And they’ve got the cable networks and network outlets. And yet, so often they are late to these stories. I made the point in my piece that were it not for the black media, in particular, the story of Trayvon Martin would never have become the mainstream media story that it was. In black radio, in the black blogosphere, they were raising this issue for weeks and weeks and weeks before the mainstream media finally came to the story. And now everybody knows, of course, the name, sadly, of Trayvon Martin. I raise that to ask: Where do you find the resources, and how does an independent production like Democracy Now! get to North Dakota and other places to cover these stories before the mainstream media even hears about it? AMY GOODMAN: I mean, it’s much more about being tapped into what’s happening on the ground. How were we covering Occupy Wall Street before September 17, 2011? And then there, as the corporate media, even though it was in the media metropolis of the world, in New York City, and the media moguls were driving by in their limousines, they weren’t covering this. And then, when they finally were forced to—thousands of people camping out, you know, right next to Wall Street—they ridiculed them. But they persisted, and that movement has, you know, changed history. They occupied the language. Everyone knows what 99 percent is and what 1 percent is. And I think Native Americans are following that tradition. They are there. They are camped out. Their numbers are only growing. They lose court decisions, then they win court decisions. Then an unprecedented letter comes from the executive, from President Obama on down, saying that the Army and the Interior and the Justice Departments will support the tribe in some kind of communication that will lead to a decision that is justly made. Whether that happens, though, that’s not determined. And then, finally, an appeals court decision coming down and saying the company cannot continue to build in the area around the Missouri River. They are building in other places. And, by the way, Native Americans are taking their battle 50, 70 miles away from the campgrounds, wherever they see the pipeline being built. And they’re risking so much. Well over scores of people are being arrested at protests. Some of them are locking down. They feel that it’s only going to come from their resistance on the ground. It’s the government and it’s the courts responding to that. So they’re just moving forward. TAVIS SMILEY: Amy Goodman of Democracy Now!, thank you for your work. Thank you for your witness. Always good to have you on the program, Amy. AMY GOODMAN: Thank you so much, Tavis. TAVIS SMILEY: That’s our show from Los Angeles. Thanks for watching. And, as always, keep the faith. 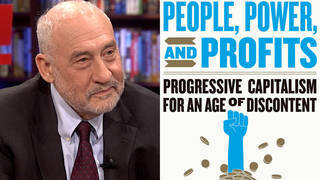 See more Democracy Now! reports on the Dakota Access pipeline.